A file with the FLAC file extension is a Free Lossless Audio Codec file, an open source audio compression format. It can be used to compress an audio file down to around half of its original size. Audio compressed via the Free Lossless Audio Codec is lossless, meaning that no sound quality is lost during the compression. This is very much unlike other popular audio compression formats that you've probably heard of, like MP3 or WMA. FLAC File Open in VLC. The best FLAC player is probably VLC because it supports not only FLAC but lots of other common and uncommon audio and video formats that you might run into in the future. However, nearly all popular media players should be able to play a FLAC file, they might just require a plugin or extension to be installed. Windows Media Player, for example, can open FLAC files with Xiph's OpenCodec plugin. The free Fluke tool can be used on a Mac to play FLAC files in iTunes. GoldWave, VUPlayer, aTunes, and JetAudio are some other FLAC players. To listen to FLAC files on an iPhone or Android, install the VLC app from iTunes or via Google Play. The JetAudio app is another FLAC player for Android. The Free Lossless Audio Codec community hosts a website dedicated to the format and keeps a well-maintained list of programs that support FLAC, as well a list of hardware devices that support the FLAC format. FLAC to MP3 Conversion at Media.io. The fastest way to convert just one or two FLAC files is to use a free file converter that runs in your browser so you don't have to download any software. Zamzar, Online-Convert.com, and Media.io are just a few examples that can convert a FLAC to WAV, AC3, M4R, OGG, and other similar formats. If your FLAC file is large and would take too long to upload, or you have several of them that you want to convert in bulk, there are a handful of completely free audio converters you can install to your computer that convert to and from the FLAC format. Free Studio and Switch Sound File Converter are two programs that can convert FLAC to MP3, AAC, WMA, M4A, and other common audio formats. To convert FLAC to ALAC (ALAC Encoded Audio), you can use MediaHuman Audio Converter. If you need to open a plain text FLAC file, consider using a text editor from our Best Free Text Editors list. FLAC is said to be the "first truly open and free lossless audio format." It's free not only to use but even the whole specification is freely available to the public. The encoding and decoding methods do not infringe on any other patents and the source code is freely available as an open source license. FLAC is not intended to be DRM-protected. However, even though the format doesn't have any built-in copy protection, someone can encrypt their own FLAC file in another container format. The FLAC format supports not only audio data but also cover art, fast seeking, and tagging. Since FLACs can be seekable, they're better than some other formats for editing applications. The FLAC format is also error resistant so that even if an error occurs in one frame, it doesn't destroy the rest of the stream like some audio formats but instead just that one frame, which might only amount to just a fraction of the whole file. You read lots more about the Free Lossless Audio Codec file format on the FLAC website. 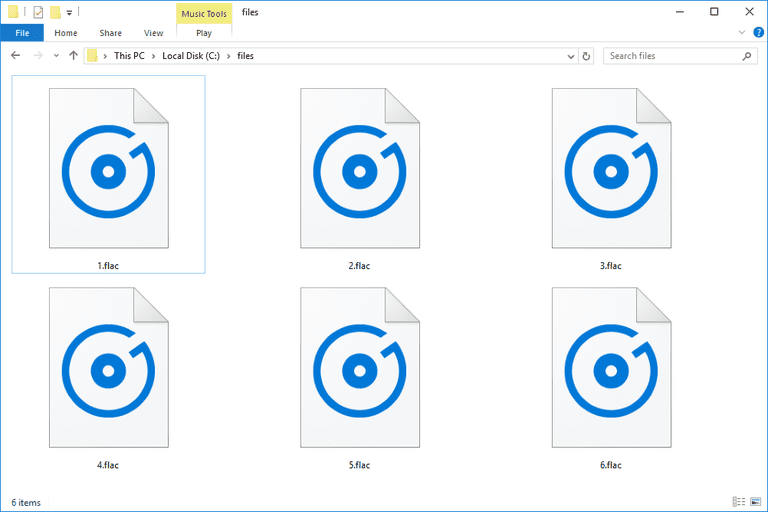 Some file extensions look like .FLAC but are actually spelled differently, and so mostly likely can not be opened with the programs mentioned above or converted with the same conversion tools. If you can't open your file, double-check the extension — you might actually be dealing with a totally different file format. One example is the Adobe Animate Animation file format that ends its files with the .FLA file extension. These types of files open with Adobe Animate, a program that cannot open FLAC audio files. The same is true for FLIC (FLIC Animation), FLASH (Frictional Games Flashback) and FLAME (Fractal Flames) files. Those formats are not the same as FLAC, so other programs are needed to open them.